Our tour guide will meet you and transfer you to the Six Eighty hotel in the heart of the Nairobi City for Check in and Relaxation. Depart Nairobi early in the morning by road through coffee and tea growing areas of Kenya to Samburu National Reserve arriving at the Samburu Serena Safari Lodge at midday in time for lunch. Samburu reserve large stock of antelopes has attracted many lions and leopards. 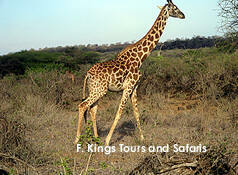 The Reticulated Giraffe and Grevy Zebra, rather rare in other parks, are here quite common, as well as the long necked Gerenuk. Dinner and overnight at the lodge/camp. Early morning game drive, then breakfast at at the lodge/camp, then continue the search of wildlife and birds in wild beauty of Samburu land. After lunch at the lodge game drive until sunset in Samburu, Buffalo Springs and Shaba. Dinner and overnight at the lodge/camp. After breakfast depart for Lake Nakuru National Park. Lake Nakuru is world famous for its stunning flocks of lesser flamingoes which turns its shores pink. Its birdlife is renowned world wide. 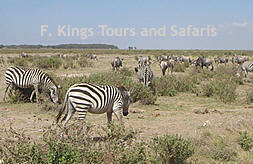 On arrival in the park, have a game drive en-route to Lake Nakuru Lodge for lunch. After lunch at the lodge proceed for the afternoon game drive around the lake until sunset. Dinner and overnight at Lake Nakuru Lodge. 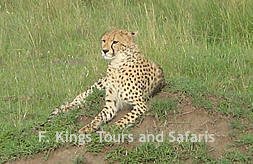 Full day spent in Masai Mara in search of the big five where concentration per squire kilometer is the highest. All meals and overnight in the lodge/camp. Early morning game drive before breakfast. After breakfast leave Masai Mara and drive back to Amboseli with lunch en-route. Arrive in Amboseli early in the late in time for lunch, afternoon game with a chance to see Elephants, lions, cheetahs, gazelles, wildebeests, buffalos zebras, warth ogs, different birds and of course Mount Kilimanjaro. Visit to Masai Village at extra cost. Lunch, dinner and overnight at Your Amboseli safari lodge/Luxury tented camp. Spend the whole day in Amboseli with morning and afternoon game drives with a chance to see huge herds of elephants, lions, cheetahs, gazelles, wildebeests, buffalos zebras, warthogs, with the great and majestic Mount Kilimanjaro offering a breathtaking and awe inspiring background. Lunch, dinner and overnight at Your Amboseli safari lodge/Luxury tented camp. Early morning game drive starts at 0600 Hrs before returning to the lodge for breakfast. Thereafter checkout and drive to Tsavo West national park with game viewing en-route t o Ngulia safari lodge for check-in and lunch. 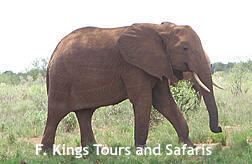 Afternoon game drive which includes a visit to the Rhino sanctuary. Dinner and overnight in Ngulia safari lodge. Breakfast game drive to view the beautiful Tsavo West mountains, visit the famous Mzima Springs, spot the Hippos, Crocodiles and different types of Fish in the crystal clear waters. Drive out of the park and to Mombasa with lunch at Voi town. Spend two days in your beach hotel relaxing and lazing on the beach shading off the tire you got from the safari. After breakfast our driver guide will pick you from your hotel and drive you to the airport for your scheduled flight back home.